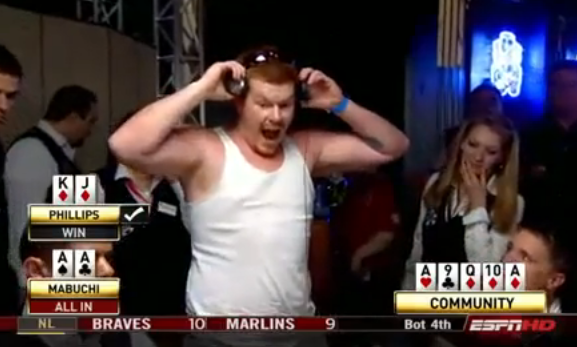 Post Your Worst Bad Beat: If there’s one thing poker players want to talk about, it’s bad beats. Walk around town one day wearing a Pokerstars t-shirt, and someone will come up to you and ask if you play online poker. More than likely, the very next words out of their mouths will be telling you about how their aces got cracked the night before. Poker players remember specific bad beats a long time after they happen, and just love to tell anyone who will listen all about how they got their money in as a 95% favourite. So here’s your chance boys. Mine would have to have been when I hit Kings over Aces and lost to Alex’s Royal Flush a few years back at Jack’s place. I remember that it was prominently featured in that week’s blog, lol. Tell us about yours. Was it at our games or somewhere else? Game is at Murray’s this coming Friday because things are a tad frosty between the wife and I, and I want her to cook some nice edibles for us when we do play at my place which will be the following week. Here’s hoping she’ll warm up by then. See you all at The Weasel’s. Worst bad beat story for me was online. Flopped four Q’s on a QQA board, turn comes an A and he flips over 4 Aces! What a prick lol.